100% Genuine. Imported from UK and USA. Premium Velcro-adjustable chin support strap designed to hold your lower jaw in a forward and closed position so you won't snore. This will prevent the lower jaw from falling back and closing off the airway in your throat. Can work with your CPAP mask. ► Fully adjustable fits any head size. ► Made of stretchy, comfortable Nylon and Spandex material. ► Washable and long lasting. Non toxic and hypoallergenic. ► Factory sterilized sealed package. ► Unique design: One piece, two straps unit. One of the main culprits of snoring is a clogged airway. 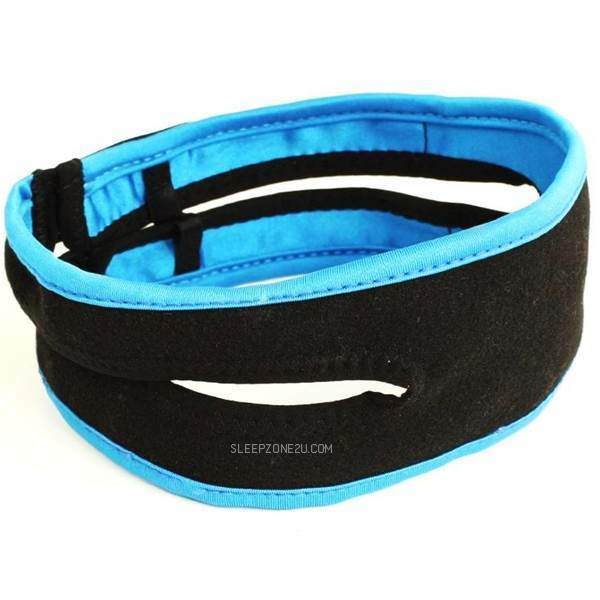 The Snore Eliminator™ adjustable chin strap (jaw supporter) is an affordable and effective solution that is worn across the chin and around the top and back of the head. It is used primarily to treat mild to moderate snoring caused by sleeping with the mouth open. The Snore Eliminator™ chin strap assists in keeping the jaw and mouth closed, thus forcing the mouth snorer to breathe through the nasal passages. When your lower jaw is held in a forward and closed position, the muscles and tissues that were once "clogging" your airway and causing you to snore are no longer impeding airflow. With an open airway, snoring can be greatly minimized. The Snore Eliminator™ chin strap features vertical design that promotes a vertical angle of force on the chin (as opposed to horizontal) in order to reduce the potential of inducing sleep-related events. The adjustable support strap that attaches to a split section of the chin strap and wraps around the back of the head for the ultimate in stability and adjustability. This effective solution ensures smooth and hassle free breathing by keeping your mouth closed while you sleep thereby keeping the airways clear to frequent snorers. It's lightweight design supports your jaw comfortably closed while you sleep. By simply changing from a mouth to a nasal breather, snoring can be decreased or completely eradicated beginning the first night! An additional benefit is that it can greatly reduces dry mouth/throat. The end result is that you breathe more freely while you sleep, stop snoring, and get a better nights sleep! 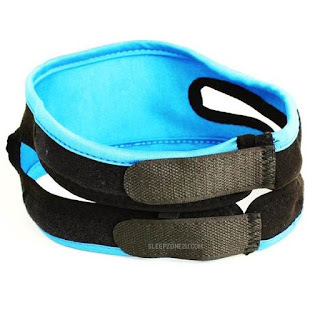 Chin Straps are often used for those who experience problems associated with open mouth-breathing during their CPAP therapy. A chin strap can solve these problems by holding the mouth closed during sleep, and may prevent the patient from having to wear a full face CPAP mask. Can be used with most types of mask headgear. 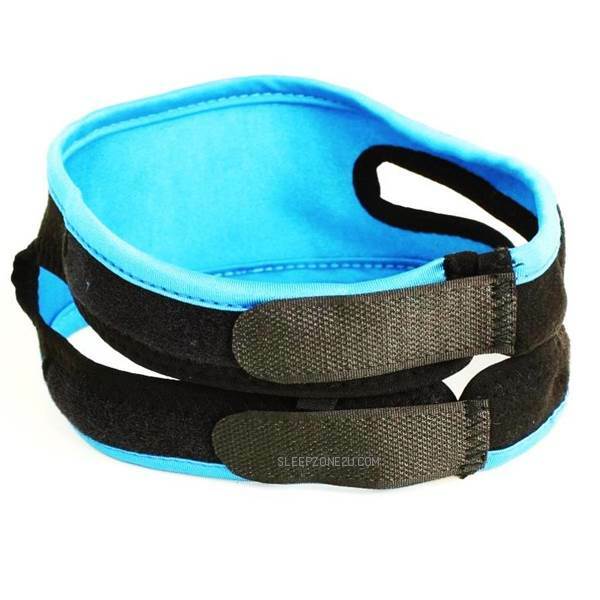 This chinstrap is adjustable with velcro fastening so that one size fits all. How Does Chin Strap Work? As the muscles throughout your body relax during sleep, your jaw relaxes as well. In some cases, your chin will drop down causing your mouth to open which may result in snoring. Adding to the issue is the relaxation of the tissue in the back of your throat. This can cause your tongue to fall back, blocking your airway so you begin to snore. The Snore Eliminator™ chin strap addresses these issues by keeping your mouth closed and preventing your tongue from sliding backwards as your muscles relax. You should avoid using the chin strap if your nose is blocked due to an allergic condition or because of an infection such as sinusitis. Ask your partner if you sleep with your mouth open. 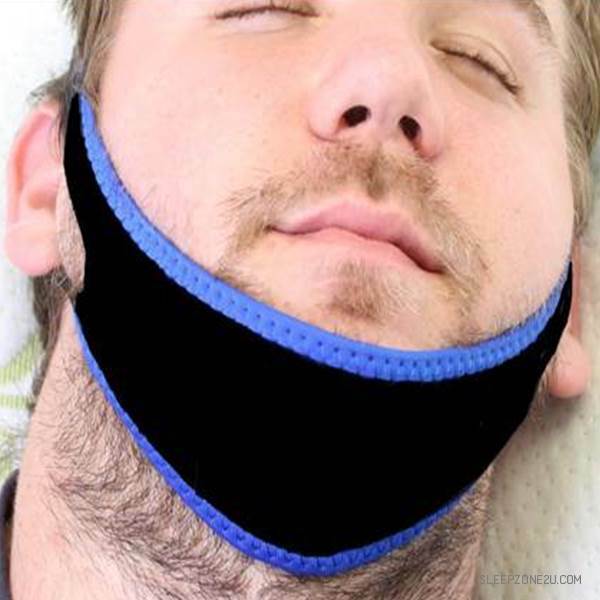 If it sounds like the snoring comes from your mouth, then try a chin strap. If you snore with your mouth closed, or through your nostrils, the the chin strap may not work. 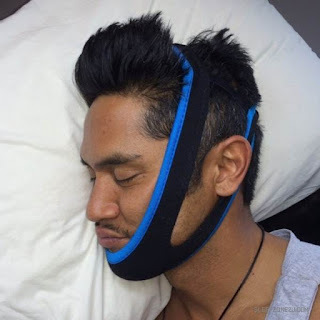 Ask your partner to observe if the snoring subsides by using the anti-snoring chin strap. If it does, that’s great! However, if it doesn’t, or if your partner says the snoring has been replaced by a choking or gasping sound, please visit a doctor at the earliest to find out if you have a more serious sleeping condition. Are there any side effects to using Chin Strap? How durable is the Chin Strap? With frequent use, the Chin Strap should last approximately 6 months. Who can use Chin Strap? Anyone can safely use Chin Strap, unless advised otherwise by a licensed physician. If continued discomfort occurs, refrain from using Chin Strap. Is the Chin Strap product safe for contact with the skin? The Chin Strap is completely latex-free and completely safe as it was specifically designed for direct contact with the skin. How should I clean Chin Strap? The Chin Strap should be cleaned by hand wash using a mild detergent. Rinse well and line dry. Do not use bleach. Do not iron the Chin strap. Do not put in the clothes dryer. Making responsible decisions regarding your health and wellness is your right and responsibility. It is critical for you to educate yourself and understand the contents and effects of the our website and products. The views and nutritional advice expressed by SleepZone are not intended to be a substitute for conventional medical service. Always consult your physician or health care professional before using this product. Information and products appearing on this website may have not been evaluated by the FDA. The products described herein are not intended to diagnose, treat, cure, or prevent any disease. If you are under the age of 18, pregnant, lactating, are allergic, have any other medical condition, please consult a physician before use. Discontinue use if any allergic reaction occurs. If you have or suspect that you have a medical problem, promptly contact your health care provider. No material or product on this website is intended to suggest that you should not seek professional medical care, or that you should disregard professional medical advice. No information, service or product offered by SleepZone should be interpreted as a diagnosis of any disease, nor an attempt to treat or prevent any disease or condition. Results may be greater than or less than those depicted on this site and can be influenced by other factors, such as your existing condition or under the influence of drugs or alcohol. We highly recommend our products only be used in accordance with guidance from your physician. KEEP PRODUCTS OUT OF THE REACH OF CHILDREN. The 30-Day Money Back Guarantee is only offered to USA customers and not applicable to customers outside of the contiguous United States. Code: Insert your country + telco telephone/mobile code. Phone: Insert your telephone/mobile dedicated numbers.